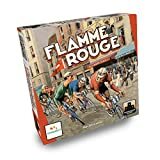 In the cycling world, a red flag - Flamme Rouge - signals the last kilometer in a race. It is a sign of the last stretch, and the competing cyclists know to give their all! 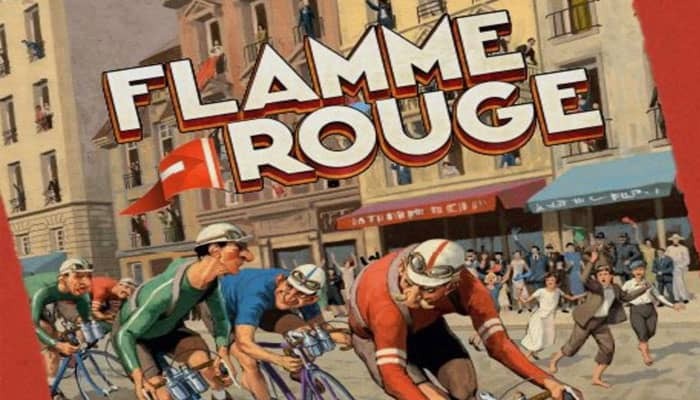 Gathered on the outskirts of Paris, cyclists from all around the world have arrived to participate in a great race. Everyone wants to ride underneath that red flag towards fame and glory! Spectators are bound to witness a true bout of stamina and strategy. May the best team win! The players' goal is to be the first to cross the finish line with one of their riders. If more than one rider crosses the line in the same round, the one who gets furthest across wins. Players move their riders forward by drawing and playing numbered cards, which show how far each rider moves. 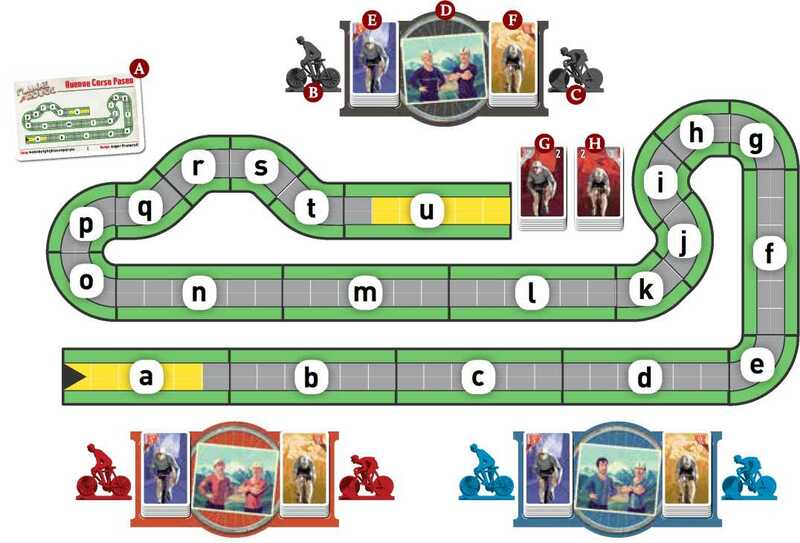 Pick a stage card, and lay out the track tiles as depicted on it. For your first game: Use the Avenue Corso Paseo stage card A. For all the tiles, use the sides marked with lowercase letters (a,b,c…) as shown on the card and in the picture below. Take a sprinteur B and a rouleur C model, their matching energy cards, and a player board D of your color. Shuffle your sprinteur's energy cards to form a deck E , and place it on your player board face down on its indicated space. Then, do the same for your rouleur's energy cards F.
Place all sprinteur exhaustion cards G face up within easy reach of all players. 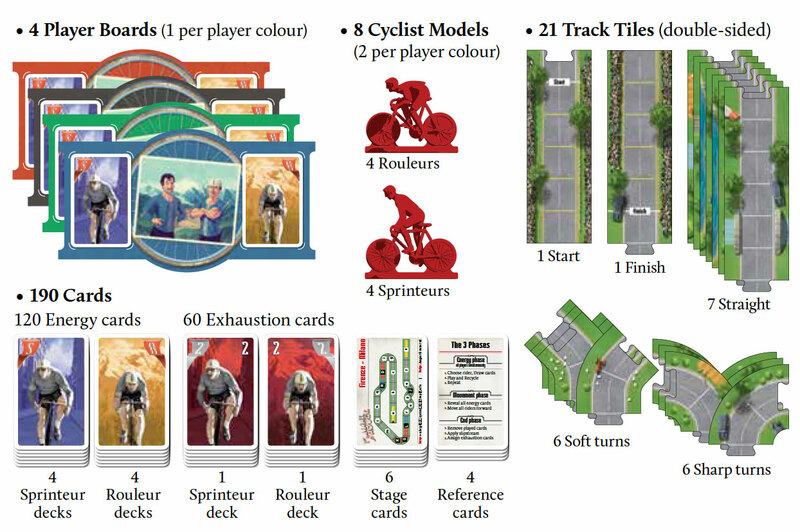 Then, do the same for rouleur exhaustion cards H.
The track tiles are identified with lowercase and capital letters in the lower left corner, e.g. a on one side and A on the other. The start and finish tiles are highlighted with yellow. The start tile is also marked with . At the bottom of the stage card, there is a string of letters that shows you the correct order of the tiles. The player who most recently rode a bike (youngest if tied) freely places their two riders in any free lanes, behind the Start line. Continue in a clockwise order around the table until all riders have been placed. Squares are divided from each other with thick white lines. In the Energy Phase players (simultaneously) draw 4 and play 1 card face down for one of their riders first, then the other. In the Movement Phase all played cards are revealed and riders move according to their card. In the End Phase the played cards are removed, then slipstreaming and exhaustion are applied. This phase is done by all players simultaneously. 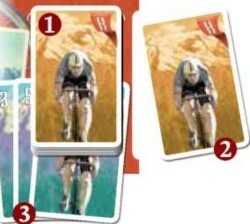 Choose one of your riders (sprinteur or rouleur) and draw four cards from his energy deck 1. Select one of the cards and play it face down 2 next to the matching rider's energy deck. This card indicates the rider's movement value for this round. Recycle the unplayed cards 3. After this, repeat steps 1. and 2. for your other rider. When all players have played a card for both their riders, proceed to the Movement Phase. Recycle: place the card(s) face up at the bottom of the matching rider's energy deck. You may look at the recycled cards at the bottom of your decks at any time, but not the face-down cards. You cannot draw cards for your second rider before playing the card for your first one. You can look at your played card(s) whenever you like. If your energy deck runs out of face-down cards, shuffle the recycled cards and place them back on your player board face down. Keep drawing until you have four cards in hand. If there are fewer than four cards total in your energy deck (recycled & face down), simply draw all cards. Turn all played cards face up. Starting with the frontmost rider, move each rider forward the exact number of squares on his matching card. You can change lanes at no additional costs. A rider landing in an empty square must always be placed in the right-hand lane. The frontmost rider is the rider closest to the Finish line in the right-hand lane. A rider can move through other riders, but cannot end their movement on them. If a rider would end his movement on a fully occupied square, he must stop behind it, in the first square with a free lane. Blue sprinteur moves first (energy value 5). Red rouleur moves next (energy value 5). He would end up in a fully occupied square. He has to end his movement on the first square with a free lane. Remove all played cards from the game. Cards can be used only once per game. Starting with the backmost pack of riders, move every pack that gains slipstreaming one square forward. Pack: consists of one or more riders that have no empty squares between them. Slipstreaming: Check if there is exactly one empty square between two packs. 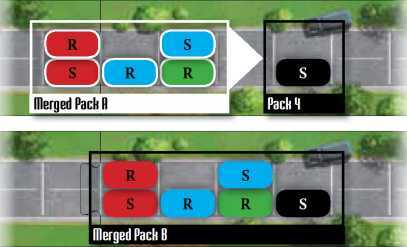 The rear pack is moved forward one square so that the two packs merge. Then, check if slipstreaming applies to this new pack. Keep going through the rest of the packs. Riders may gain slipstreaming several times in one round. Starting with the backmost pack 4 move all applicable packs in order. Pack 1 does not move, because it is more than one square away from Pack 2. Pack 2 moves because it is one empty square from Pack 3. The Merged Pack A moves because it is one empty square from Pack 4. Thus, the riders in Pack 2 got to move two squares, and Pack 3 got to move one square. If your rider is exhausted, take an exhaustion card matching your rider (sprinteur or rouleur) and recycle it. Exhaustion: A rider is exhausted if he has an empty square in front of him. Are used exactly like any other energy cards with a value of 2. Give a matching exhaustion card to every rider that has an empty square in front of him 5. An empty lane in front of a rider 6 does not cause exhaustion-in a real life race the pack is driving in the middle of the road, not in lanes.